You’ve heard of acai bowls, but now there’s a new kid in town! And its something even better: pinole bowls! Imagine a breakfast that was filling but super-healthy, loaded up with fresh ingredients and health-boosting antioxidants. Now imagine that this breakfast also provided 20g+ grams of protein and 30% of your daily fiber, enough to keep you full and energized all day long. It’s not! Any combination of pinole and fresh toppings is not only healthy, it’s easy to prepare as well. But don’t take our word for it; read on for this great recipe and taste it for yourself! As we head into warmer weather its a perfect time to harness the natural inflammation-reducing power of cherries, since they’re sweet and juicily ripe. This pinole bowl marries the mellow flavor of dark cherries with crunchy granola and nuts for a summery, energy-boosting breakfast. One serving of pinole provides twice the antioxidants of blueberries while nuts offer healthy fats, making this bowl tasty and great for muscle repair and an extra boost of immunity. Dissolve 1/2 cup of pinole into 1 1/2 cups of milk or milk substitute (almond or soy milk work great!). Pour mixture in pot and place on stove on MEDIUM-LOW heat. While the pinole simmers, remove the stems and pits from the cherries and set aside. Cook for 3-5 minutes or until pinole begins to boil and thicken. When it reaches your desired consistency (for thicker pinole cook longer),take it off the heat, allow it to cool for a moment, and pour it into your favorite breakfast bowl. Sprinkle on the granola, add the cherries, and top with nuts! When you’re ready, dig in and enjoy the vitality-boosting powers of this yummy breakfast! 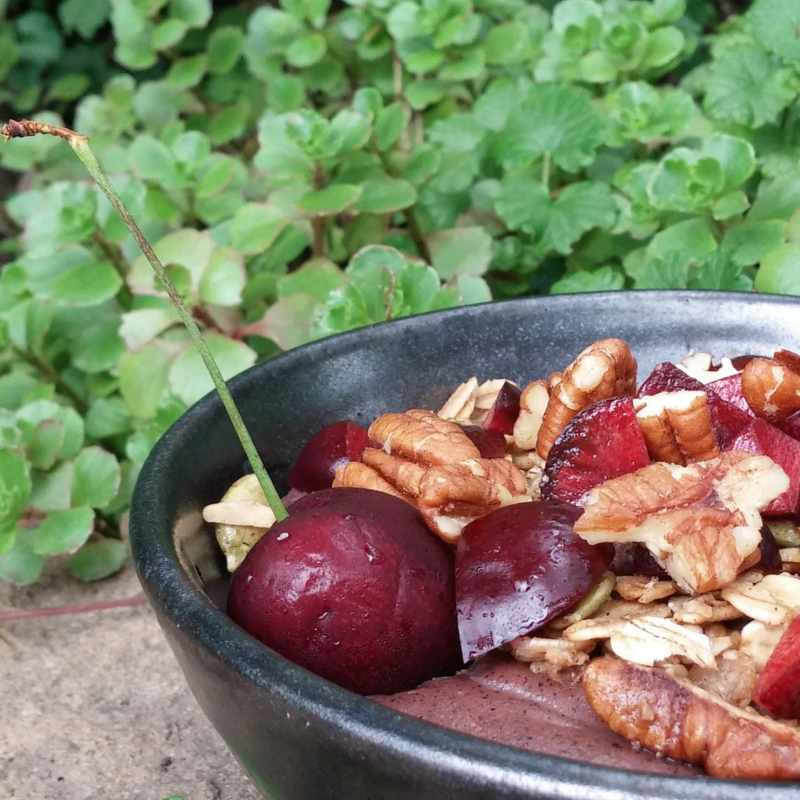 Have your own ideas for a delicious and healthy pinole bowl? Snap a photo and tag us on Instagram @PurelyPinole for a chance to be featured on the Purely Pinole blog, Facebook, or Instagram accounts. We can’t wait to see your creations! Sounds yummy. Thanks for the ideas!